Morning Recordings, written by Pramod Tummala, and fleshed out with the assistance of nearly a dozen friends, delivers a spellbinding record with Music for Places, a ten-track collection of hazy, pop-laden songs that are quite reminiscent of early mornings. Fresh from a slumber, your eyes just opening, the morning becoming reality, as you crawl out of bed and try to adjust to the new day. Music for Places captures those feelings too well, the breeze-y, gentle songs seeming to blossom as they try to take shape and form, still retaining a bit of the slowness that comes with just waking up. Moving along at a snail's pace, the soft-sung, gentle numbers seem to just float from note to note, the melodies developing as one note drifts into another, Tummala's voice the glue that holds it all together. Raindrop like guitars, faint percussion, and weeping bass are the core, though Tummala and friends flesh out the airy songs with other instruments throughout, including bowed vibraphone, baritone sax, Hammond organ, Wurlitzer piano, cellos, strings, Rhodes piano, and more, giving the songs a lush feel, somehow retaining the intimacy that makes this record so eloquent. Take "Leela, Our Time Is Running Out", the Hammond organ humming in the background, while the piano chimes in with an effect not unlike raindrops on the window, all while Tummala's voice seems at ease as he sings, seemingly straight from his heart to a lover sitting right next to him. Or, "Your Light Has Never Shown", the light strum of the guitar leading the way, as Tummala's voice follows without hesitation, cellos heightening the experience and enriching the song, while a Wurlitzer makes you want to melt. And the Hammond adds soul to the already full number. Somehow, amongst all these instruments, Tummala has managed to create something layered, but not sacrificed intimacy or honesty in the process, always putting his words first, allowing them to soak into the music, as the listener does the same thing. 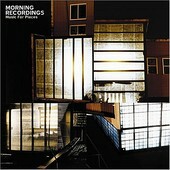 Morning Recordings' Music for Places is the intimate record every musician wants to make, though never knows how to achieve it. It sacrifices nothing in tearing down the walls and going direct to the listener. All the sounds, all the words, all the feelings -- everything -- is clear and present, nothing hiding behind another, or being overshadowed by something else. It is as pure as it comes, but anything but lo-fi. It is high-fi indie-pop-folk for those who love to feel what they're listening to. I'll give it an A.